The onslaught of news about violence seems to be endless these days. I find myself asking a lot of questions. Are these horrific things happening in the U.S. because of our Republican presidential nominee? Do certain people think bad behavior is ok because they hear the Republican nominee regularly threatening, valorizing and inciting violence? Is a ‘lone wolf’ inspired by a terrorist group’s ideology going to be the new normal? Is it now socially acceptable to stir up the pot, get in confrontations and fight with strangers? Am I just being dramatic, and this has been happening for years, but we tend to hear more about it now? I’m not going to pretend to know what it’s like to be a person of color or a member of a marginalized group. I’ve had a pretty darn easy life. But what I do know is that every time I hear about another act of violence, my initial reaction is to question the world in which I live. This blog is meant to be about my kitchen inspirations, but honestly, I haven’t been particularly inspired these days. I have been doing a lot of ‘comforting’ things such as jam-making, and returning to soothing desserts I associate with contentment. I recently made one of my favorite desserts that is spoonful after spoonful of rich chocolate wonderfulness. I’d never suggest something as trivial as being able to solve our world’s problems with chocolate. However, I will say for me, chocolate pots de crème has the ability to temporarily make things feel ok. 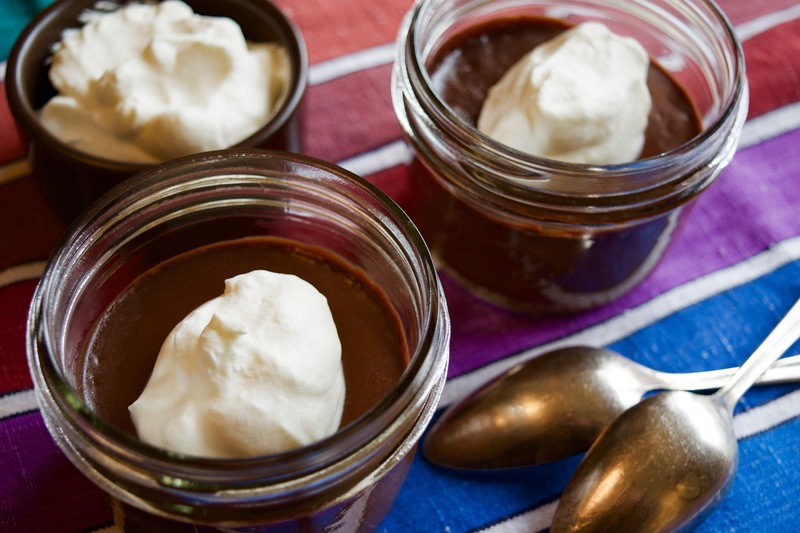 I first experienced this particular chocolate pots de crème about seven years ago at a restaurant in Sacramento called Masullo Pizza. My husband and I had spent the day skiing in Tahoe, and we decided to stop for dinner on our way home to the Bay Area. I’m a sucker for chocolate pots de crème, so when I spotted it on Masullo Pizza’s dessert menu, I was all about it. After finishing, I was certain it was one of the, if not the best version of pots de crème I had ever tasted. And me being me, I of course wanted to see about getting the recipe so I could recreate it at home. I spoke to our waitress about the recipe, and she said she would ask the owner. In my experience, and I tend to ask for recipes a lot, restaurants are usually not willing to give away recipes. As we were paying our bill, a man came up to our table and introduced himself as Robert Masullo, the owner of Masullo Pizza. I gushed about how much I loved his chocolate pots de crème. He said he would be happy to provide me with the recipe, but he would need to adjust it down to home kitchen proportions. 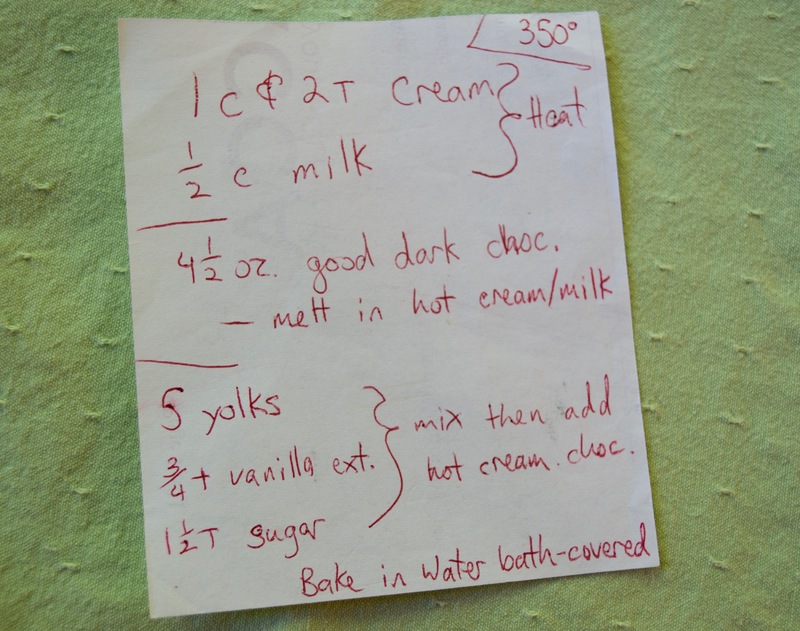 He returned to the kitchen and a few minutes later reappeared with a scrap of paper with his chocolate pots de crème recipe on it. 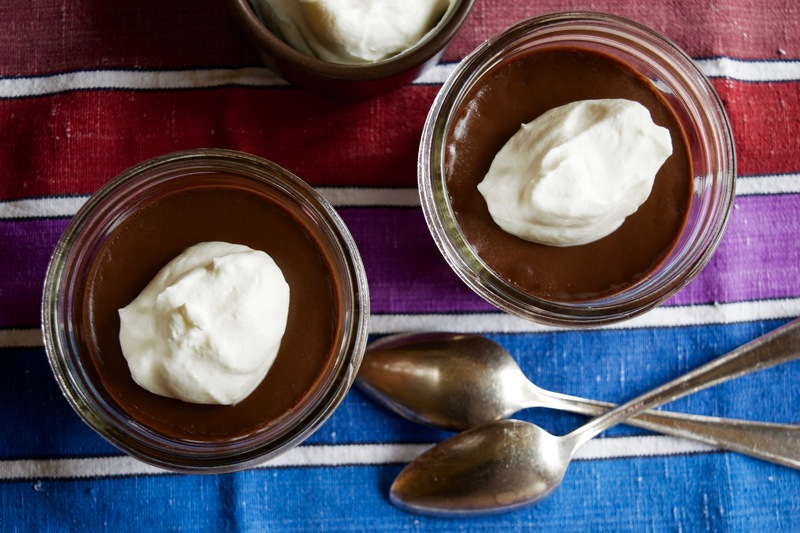 I’ve been making Robert Masullo’s chocolate pots de crème ever since. It’s great with or without whipped cream. 2. In a small saucepan, heat heavy cream and milk over low heat until barely simmering. Add chocolate and melt into hot cream mixture. 3. Remove saucepan from heat and add egg yolks, vanilla and sugar, mixing until all ingredients are incorporated. 4. Divide mixture among 6 jars or oven save custard cups. Place jars in large baking pan. Add enough warm water to pan to come halfway up sides of jars. 5. Bake until pots de crème are set, but centers still move slightly, about 45-50 minutes. 6. Remove from water and chill until cold.